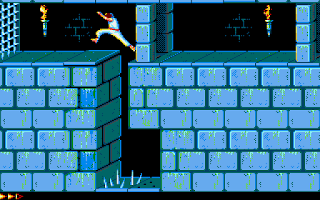 Peter Putnik has released an audio-enhanced version of Prince Of Persia for the Atari STe. It now features cleaner samples and, because the DMA hardware handles the playback, the results are a faster/smoother gameplay experience. There is a video on YouTube but it's FAR better using real hardware - so downloaded it now!! 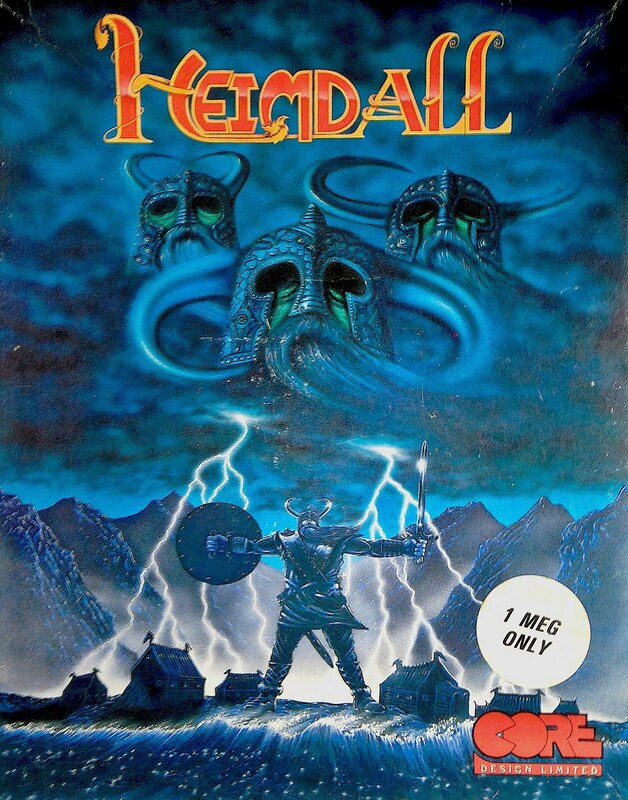 First up, is Heimdall with its excellent cartoon-style visuals and a funny storyline depicting life as a Viking demi-god on his brave mission. 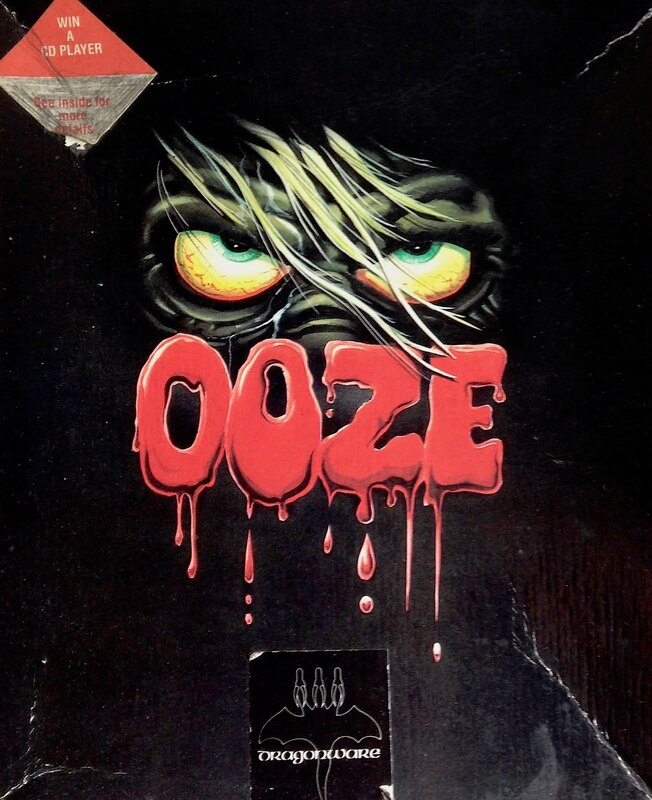 Three silly games first need to be mastered before you can choose a decent crew of dodgy-looking characters and I dare you not to giggle during the drunken axe throwing contest! Sadly, I personally feel Core should have got more from out of a 1MB computer because it feels like a weak Ameoba port and could so easily have been much better. However, this doesn't distract from what is ultimately a humorous and crazy adventure through Norse mythology. 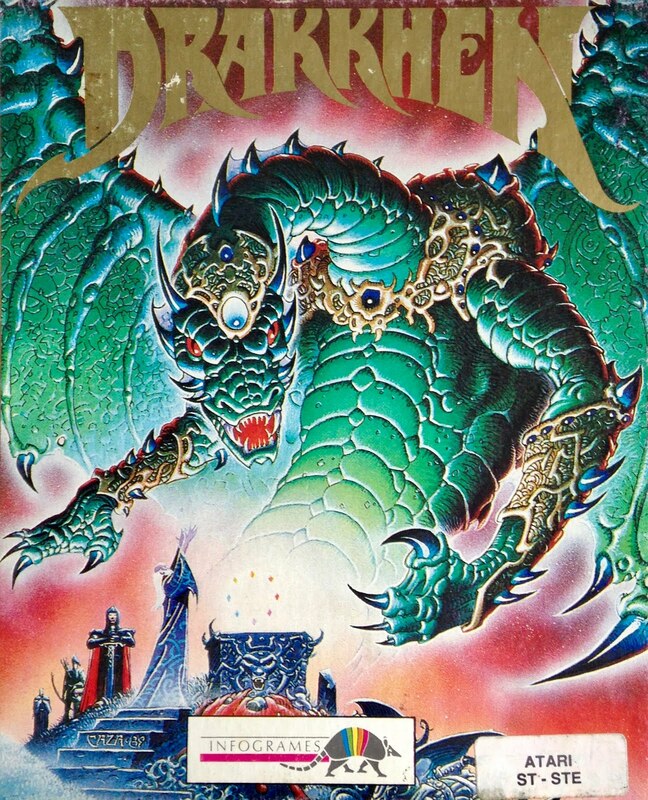 Drakkhen is a Christmas present the wife kindly treated me too and my copy is in beautiful condition, ignoring some scuffs on the rear. 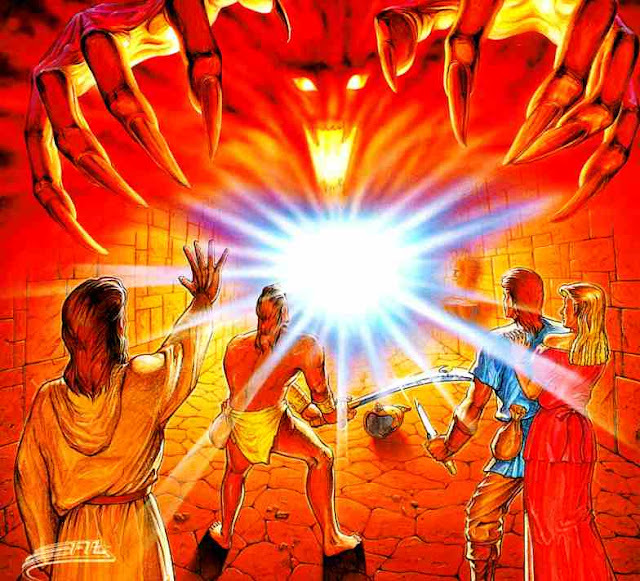 A realtime role player which involves four chosen characters and much dragon slaying. Most certainly one of my prized possessions and an RPG which I strongly recommend. 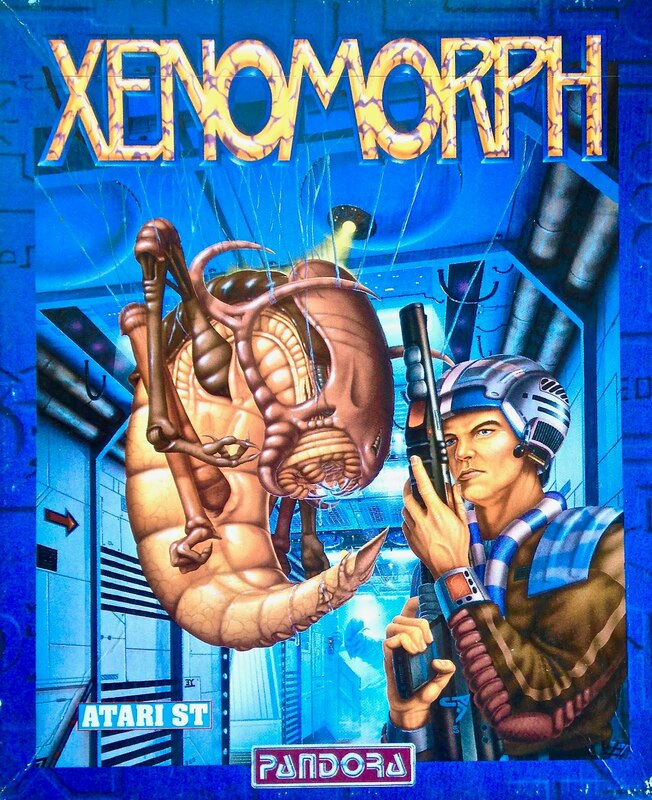 Next up is Xenomorph which can often be overlooked as merely a Dungeon Master ripoff set in space. It's far more than that and offers a great real-time RPG set onboard Atargis, an abandoned space station. 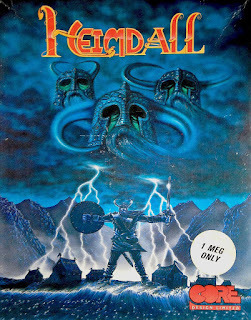 The dude on the cover always makes me think of Speedball but, ignoring that amazing fact, this is an engrossing adventure which I'm sure will appeal to all. Finally, we have an illustrated text adventure with a creepy cover and one of the silliest of storylines. You are (wait for it) Ham Burger and Mr Cheez has given you a house in Salom's Lot which is rumoured to be haunted by lots of scary things that go bump in the night. I must admit to being a little disappointed with my copy because the condition isn't great, but this is a rare title which I am proud to own! Whichever genre you prefer, I don't think you can go wrong with any of these excellent adventures. Each is different and each offer something fascinating and addictive to take an eager adventurer into the early hours. 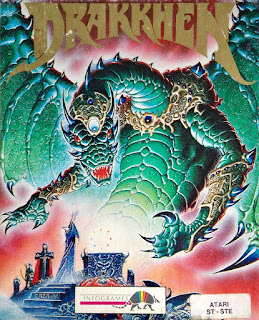 I am personally going to choose Drakkhen - before I get into trouble with the boss for wasting money! What about you? 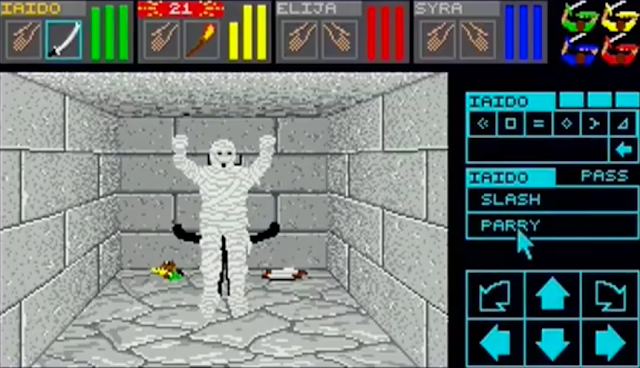 Peter Putnik has just updated Dungeon Master with replacement DMA sounds for the Atari STe (and MSTE / TT / Falcon). Sadly, I've not had the time to play it yet - but I'm definitely setting aside this weekend. This is huge news for adventurers and Peter went on to say that Chaos Strikes Back is next in line for the STe treatment - I cannot wait!! -> Back in July I made available a nifty download w/ links to the ST Action guide. -> Going back to May and I felt that FTL really was top of the pops! -> Fancy something different? 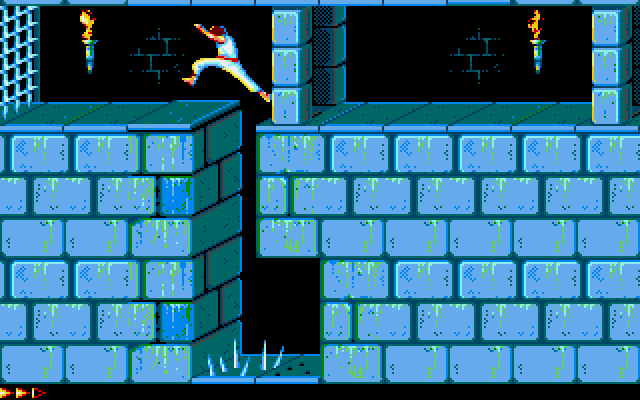 Then play the magnificent Walls Of Illusion! As many will know, I've been a friend of Scott's for a while now, even though he's from Yorkshire I've never held that against him! 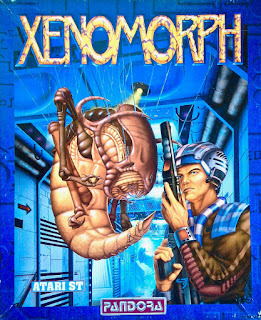 Anyhow, I've always been eager to know what he's working on, from those humble beginnings with a Turrican music disk to a near-perfect arcade version of Frogger. Too think he's not been coding that long... Incredible. 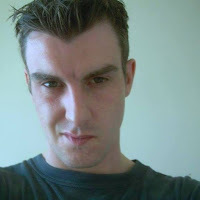 I only recently started “coding” on the ST, about 2 years ago, roughly 2014/2015 I started messing about in STOS and found it really easy to program and soon enough I was writing small routines, asking for help on the Atari forums, and generally messing about. At the same time, I was trying my hand at everything, music, games, art, programming and getting into the hardware side too. I now have an STe (Of which there is a certain unnamed person I should thank!!! - He knows who he is) and started coding in STOS full time before moving onto ASM for Frogger, which gave me credibility or notoriety. The Turrican Must Disk was created simply because I am a fan of the game. I just wasn't very good at it, to be honest, and found it far too difficult beyond the “spaceship” levels so that kind of put me off... My music demo started because I did enjoy the tunes but didn't fancy loading the actual game disk each time, and what's more impressive is the fact that this is the first time STOS has used SNDH convincingly I might add. A point missed by a lot of people - the player routine was developed by me and might be the first time STOS has ever used SNDH (note big ego trip here!). As far as music disks go, I did have the idea for a UMD style music player but it never went beyond the ideas stage. A nickname was given by a dear friend who is no longer with us, referring to my overuse of the colour black, right down to the nails and eyes. Yeah, I was a goth, but I'm now more immature than anything. :) I suppose I tend to lean on the darker side of life, metal music, Gothic architecture (Prague is awesome, need to go there!) and other such “out of the light” topics. But there is the bonkers side of me too, the sort of person that is bubbly but not annoying... by that I mean I can jump down the stairs backwards when I'm bored. Well, I could but its been a while, I've been out of sorts over the last couple of years but that's long and boring and not very interesting, suffice to say I spent some time elsewhere at NHS' pleasure. (I'm not an insane joker, just was a little poorly), I say that because that last statement read as “insane asylum”. That is where I'll leave that little beauty. You must be proud of Frogger? Frogger, to me, is the epitome of a decent arcade game - full of colour, noises, damn hard gameplay, and it doesn't involve rescuing a princess or collecting gold. I wanted to write Frogger initially in STOS because as I was playing it on #cough MAME I realised that the ST was the perfect platform for it. The game itself is simplistic enough but not rubbish AND didn't require some glorious technical ability - there is no scrolling, no bullets, and nothing beyond the ST capabilities. The fact that I got really close (using STOS) to releasing it just goes to show how easy, in terms of computing, the game was handled by the ST. Unfortunately, like all simplistic programming languages, BASIC was eventually thrown out and I started (with the huge help of Xia!!!) the process of writing the game in assembly - faster code, closer control over the ST and I could use the computer more reliably. STOS is great, but not for this due to too many things on the screen. I'm so proud of Frogger. It might not be F1 by Geoff Crammond or Anarchy by Psygnosis but it's mine, and it's my first assembly program that works. At this point, I must thank all the people involved in its creation, there are so many who gave support, ideas and actual assets I could use, like music and SFX from Zerkman and Dma-SC. Immense support and patience from XiA too .. I did get some criticism for not making it 21st-century, but I always wanted to replicate the original and never to out-do it. Besides, Reservoir Gods beat me to it, check out their version. I never thought it was going to be massive but I did feel it wasn't the kind of game that would be overlooked by people. If I liked it, as a gamer, then others surely would... hopefully anyway! Raiden is humungous #retrogaming news! It is!! I had the idea again from playing it on mameUi64 (Plug right there folks!) and looking at it, I wondered if it was possible. I wrote some routines, originally in STOS, and found it far too slow (this is before I started with assembly language and Frogger). So, after Frogger and after I'd gained some knowledge in ASM, I went back to it and had a look. I wrote some routines in assembly language and started to learn about the STE specific hardware scrolling. 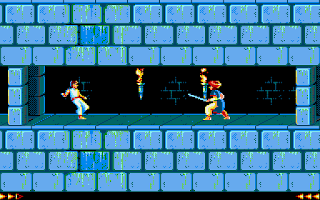 All of the music and sprites you see in Raiden are taken directly from the arcade but, because of the 16 colour limitation, I've had to look at the Megadrive version for the level's graphics. This means the levels are quite dark in colour and maybe a little too washed out - at the moment. As far as technical difficulties go, the oddest thing... the tanks are actually the most complicated, after the player, to write code for. Do you get a break and play games? Haha, where Do I begin... Flashback (Delphine) is another do-able game, despite reservations from the “scene” ;) I'm also thinking Mortal Kombat... However, whatever I do, I think it will definitely be game related. I don't consider myself a demo writer and although I've put some code into demos I don't think I'd actually write my own. I'll leave that to the pro's like DHS, their “Sea Of Colour” demo is awesome!! Games require a slightly different process to demos and I feel like I'm more suited to the games really. - Wanna download and play the best Frogger clone since the 80s then clickety click right now! 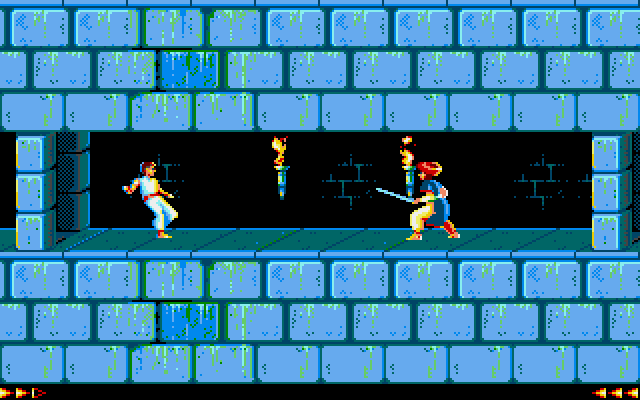 - Or clickety click here if you wanna know more about Scott's WIP Atari STe game Raiden? - Mr Black is on Demozoo where you shall find the Turrican Music Disk and more. I've just been contacted by Robin, of Robberie who are an acoustic indie group. Their latest record is all about retro gaming and features numerous devices like the Atari ST and ZX Spectrum. In fact, the Atari ST even played a role in the production using VideoMaster and this alone is mind-blowing. I was extremely fascinated by the ST's role in the production so he kindly sent information and pictures... Clickety-click to visit the Robberie website! "My 1040 STE plays a starring role in the robberie video for Everyone's a geek, helping to create the pixellated monochrome shots. To do this, footage was recorded on a video camera, which was then fed through a Microdeal Videomaster cartridge. The software has a live preview mode which displays a quarter-screen feed of whatever you play in 16 shades of grey. So the recorded footage was played back and then I recorded the output from the computer's screen on my smartphone in order to get into a format compatible with editing software on my Mac. There are some other Atari relics in the video. There are some shots of Roadblasters on my Lynx, which is modded with the brilliant replacement LCD colour screen. The shot of Pong is I'm afraid not original hardware but comes from an Atari classic tv games joystick. And the Powerplay Cruiser joysticks are the ONLY ones that I could properly play Kick Off 2 on! You can find out more about the other retro hardware to be found in the video on the robberie website."